Sunday, 28 Apr 2019 at 11:00 AM . We believe yoga is a fantastic tool for child development, helping nurture calmness, resilience and concentration for kids whilst developing physical strength and self esteem. Our classes utilise play, movement, music, breathing and relaxation as well as big dose of FUN! Experienced in the magic of childhood, our classes explore yoga through stories and games. Children learn how to use the breath as a monitor for feelings and emotions and each session always finishes with a guided relaxation. The classes aim to bring together kids in the community and create a space for playful movement as well as helping to build self esteem and confidence in every child. Our Parent and Baby classes help nurture parent and child interaction through massages, movement and fun, low-impact stretches. The friendly sessions feature plenty of singing, rhyming and games to help parents and little yogis bond, get active and make new friends. Flat Iron Square offers a variety of independent cafe's, restaurants, and shops for parents to enjoy. Nestled in the heart of London Bridge it is easily accessible by public transport and features a large garden space with a full programme of events and activities throughout the summer months. 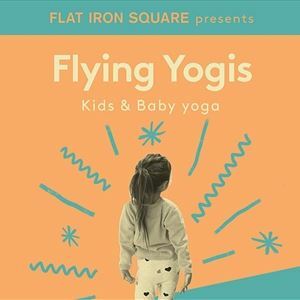 Kids & Baby Yoga in The Siding - the third arch at Flat Iron Square.